Sister Mary Richard Donahue, I.H.M. 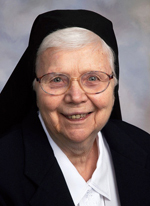 Sister Mary Richard Donahue, I.H.M., died Dec. 3 in Camilla Hall, Immaculata in the 65th year of her religious life. She was 91 years old. Born in Havertown, Sister Mary Richard entered the Congregation of the Sisters, Servants of the Immaculate Heart of Mary in 1952 from St. Denis Parish, Havertown and professed her vows in 1955. She taught and was principal and educational assistant for more than 15 years in elementary schools in the Archdiocese of Philadelphia and in the Diocese of Charleston. Sister Mary Richard’s last assignment was in the Apostolate of Prayer in Camilla Hall. The funeral Mass was celebrated at Camilla Hall Dec. 7. The principal celebrant and homilist was Father William E. Dean; also concelebrating was Msgr. Joseph Logrip. In addition to her congregation, Sister Mary Richard is survived by her sister Patricia Davis and many loving nieces, nephews, grandnieces and grand-nephews. She was predeceased by her parents James and Sophia Kennedy Donahue, her brother James (Stella), her sisters, Emma Duffy, Margaret, Irene, Marie, Catherine, Anne (William) Reilly, and brother-in-law Arthur Davis.